Weaving Yarns is available as an eBook click here. 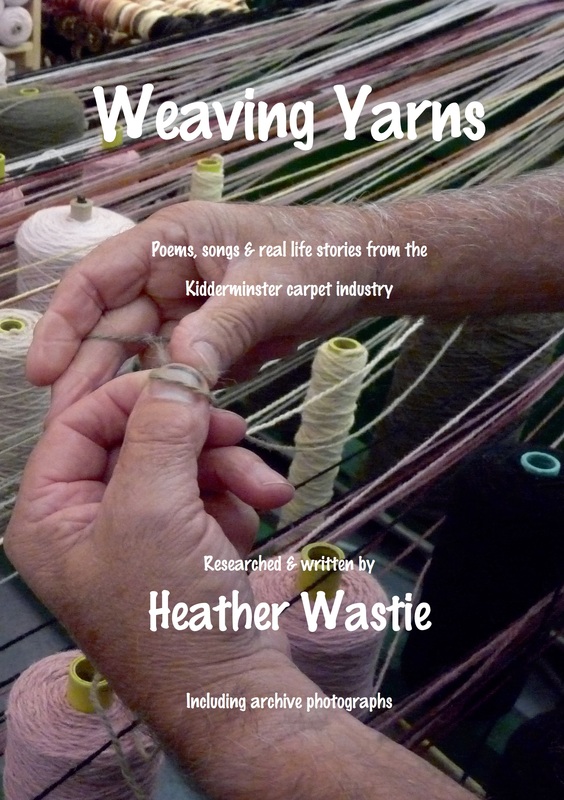 Weaving Yarns is a collection of poems, stories and even a playscript about the carpet industry and the people who worked in Kidderminster. Although [Heather] has no carpet background…her name frequently cropped up at the museum as she came in to meet many of our volunteers. Her natural smile and genuine interest helped to extract the stories and tales of former workers that ultimately formed her poems, stories and songs, with accordion accompaniments and a definite folk style. This collection reveals the unique language of an industry in which putting your body on the floor was part of the design process. Now the flights are swept away and the carpet grizzly bear is no more. Now knowing your colours is finding paint at a DIY store. Dyeing was a man’s job, but now the industry is dying. I am delighted that this body of work is now available in print for future generations. Weaving Yarns performances are available! Poet, singer/songwriter, keyboard/accordion player, actor, humourist and facilitator Heather Wastie was born in Cradley Heath and grew up in the Black Country. In 2006 she moved to Kidderminster where in 2013 she was Writer in Residence at the Museum of Carpet. In 2015, the year of publication of this book, she was appointed Worcestershire Poet Laureate. Heather has published three illustrated poetry collections. She blogs at www.weavingyarns1.wordpress.com. She has also compiled and edited two books of Black Country reminiscences which grew out of projects in Tipton and West Bromwich.